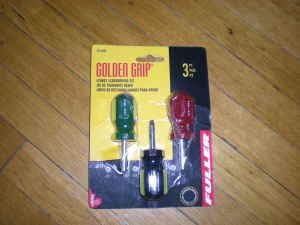 I saw that you are selling a great screw driver set for $2 http://toronto.en.craigslist.ca/tor/hsh/1188872040.html . I was just wondering, can I just have it for free please? sorry it is $2. this will be part of my transportation fee. Well the subway is $2.75 so why don't I come pick them up and you will be up 75 cents and I will be up 3 screwdrivers and nobody gets screwed (except all those SCREWS!! LOL). i am sorry but i got another email from someone who wants this with $2. so, i will sell this person. can i see you tomorrow 10am-530pm in downtown? what time is good for u? Wait a minute... I'm no rocket surgeon but I have been thinking a little bit and it seems a little fishy that you posted this ad 3 days ago and got no offers and then 5 mins after we started the communicate you received an offer for the full asking price??? Could you please forward me the offer which you received? Thanks. ok. if u say so, i dont wanna sell such a picky person. i got emails from other persons. so i decided to talk to them. i decided not to sell u.
I guess I should not have kicked a gift horse in the mouth. $2.01, let's do it. no no. sorry. but i have decided. i dont wanna make trouble with strangers. moreover, i am not in a hurry to sell it. so, i will contact other person.sorry about that.